Are you trying to set up a website, FTP server, mail server or any other type of online service? 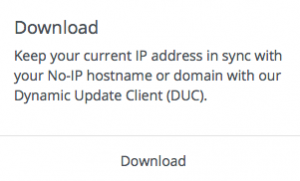 Here are a few simple steps to follow to get setup and online using No-IP’s Free Dynamic DNS service. This will allow you to run your servers at your home or business without a static IP address. To create an account with No-IP simply click the “Sign Up” link at the top of the page, fill in the required fields on the new account form and click the “Free Sign Up” button. Once you submit your account information you will be sent a confirmation email to the address you provided. Click the link provided in the email to confirm your account. You should now be logged into your My No-IP account. When you registered for a No-IP account a hostname should have been created automatically. You will use this to connect to your server. If you would like, you can create another hostname using the steps below. In order to add a hostname to your account you will want to click on “Dynamic DNS” and then the green “Add Hostname” button. After the “Add Hostname” is clicked you will see the following screen pop up. On this screen, you will type in the desired hostname (i.e. mycamera or myserver) and then select the domain you would like to use from the drop-down menu. Leave the hostname as a “Record Type “A” unless you need a specific record type. The IPv4 Address section should already be filled in with your current public IP address. If there is a different public IP address you would like to use enter it now. Finally, click on the green “Add Hostname” button. Note: If your ISP assigns you a static IP address, you can skip to Step 6. If you have a dynamic IP address, you’ll need to install No-IP’s Dynamic Update Client (DUC). This is free software available from the “Download” section of the No-IP site or by clicking on the “Download” section located on the Dashboard page of your My No-IP account. We have some basic documentation covering port forwarding and firewalls on the Support page of our site. For detailed information concerning your particular hardware or software, please consult the documentation for your equipment. In order to verify that your router and firewall are setup correctly, you can visit www.portchecktool.com. Once you have received a successful result from the Port Check Tool website, you can now run your services using the host or domain you created! If you run into trouble be sure to check the Support page of our website for helpful information.